To most people, automotive window tinting is a matter of aesthetics. However, there are many benefits. 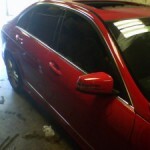 If you have a new car or an old minivan, window tinting can make your car cooler, safer, healthier and easier to drive. Whether you want dark windows that obscure your personal belongings or a light tint that blocks UV rays, your local Houston auto glass company can recommend the ideal film. Plus, installation is fast, and the process is surprisingly affordable. If you are driving a vehicle with clear windows or if you opted against factory tinting, here are a few practical reasons why you should consider aftermarket window films. Tinting is easy on the eyes. Even if you have excellent vision, a glare can make it difficult to see oncoming vehicles, traffic signals and obstacles that may create potential safety concerns. Window films prevent glare and also block the direct sunlight that causes eye strain. Direct light is especially uncomfortable for children, which is why many parents use window shades and why many minivans have tinting on all passenger windows. Films can make your car safer and more comfortable for the driver and your passengers. Health and safety are two more reasons to install UV-filtering window film. First, ultraviolet rays can cause premature wrinkles and permanent skin damage. According to statistics, the average American spends 1.5 hours in a car every day. This constant exposure to Houston’s bright sunshine can really add up over the years. Second, this bombardment of bright UV rays can break down upholstery and cook interior components. A 2006 study conducted by the Ecology Center found that flame-resistant upholstery and plastic components release toxic compounds, including phthalates, when baked in the sun. Both phthalates and PBDEs are known to disrupt hormone levels, damage organs and cause birth defects. 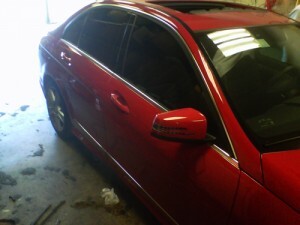 Tinting is like a pair of sunglasses for your car. Clear or tinted films block 99 percent of UV rays and anywhere from 35 to 60 percent of thermal radiation, which causes interior temperatures to soar near 180 degrees. Lower interior temperatures also mean that your car will not be scorching hot when you get in after work, and your air conditioner will not have to work as hard to cool down your vehicle and keep it comfortable. Your vehicle is probably equipped with an alarm, but window tinting is another great security measure. Window films can protect the safety of the driver, the passengers and your cargo. In an SUV, minivan or station wagon, cargo areas are highly visible. Your valuables and electronics can be very tempting to would-be thieves. If you regularly carry costly equipment or valuables in your car, window tinting can deter criminals. If thieves cannot see things to steal they will move on. Another safety aspect to consider is the added strength that tinted films can give your windows. With this protective backing, it is less likely that your Houston vehicle will need a windshield replacement. If a crack or sudden impact does occur, the auto glass will not shatter or be scattered throughout your car, and a minor windshield repair might be avoided completely. If you have considered window tinting in the past, today’s options are even better. Both clear and tinted films filter UV rays, and films are available in many colors and materials. Traditional metalized films may interfere with radio signals and wireless devices. However, newer ceramic and carbon fiber options have the same health and safety benefits but also allow these devices to function properly. Your local Houston auto glass service or windshield repair expert can work with you to select the right product and install it professionally. Most window films last for 10 years or more, so this is one investment that you can continue to enjoy for as long as you own your vehicle. This entry was posted in Auto Glass Tinting and tagged Houston Auto Glass, Houston Windshield Repair, Houston Windshield Replacement. Bookmark the permalink.